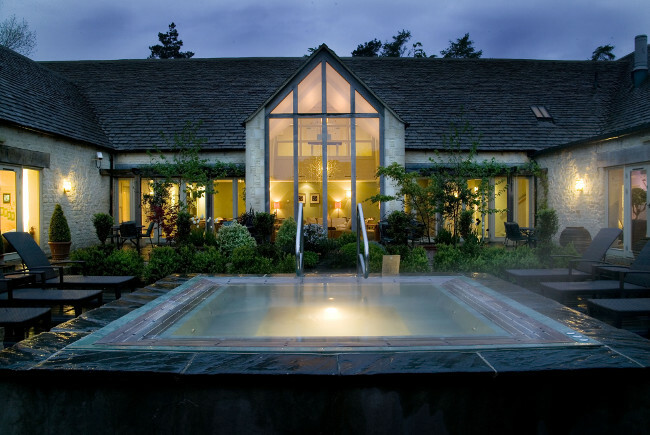 Driving down the winding roads of Tetbury, a quiet corner of the Cotswolds; my best friend Jenna and I were giddy with excitement about our weekend country escape to the infamous Calcot Hotel & Spa. I’ve loved the Cotswolds ever since my now husband and I first visited on our first break away together back in the summer of 2010. It always brings me a sense of happiness and peace when I’m there, with its beautiful scenery and quintessential English villages. 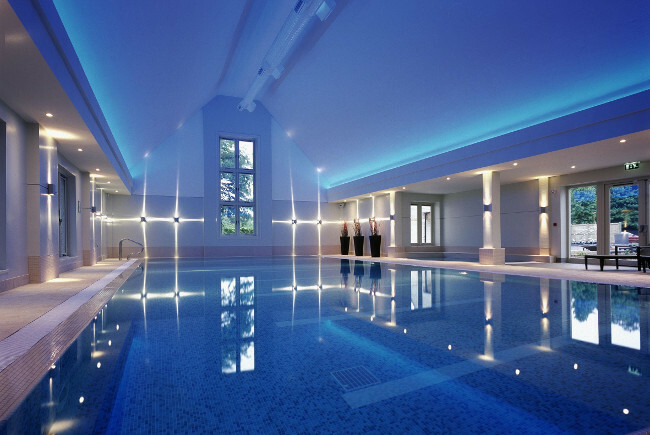 Set in over 220 acres of Cotswolds meadowland, Calcot has something to offer everyone. With 35 individually designed rooms, it’s the perfect stay-cation for a girl’s weekend away, to a romantic break with your partner, or indeed, a family stay-cation. 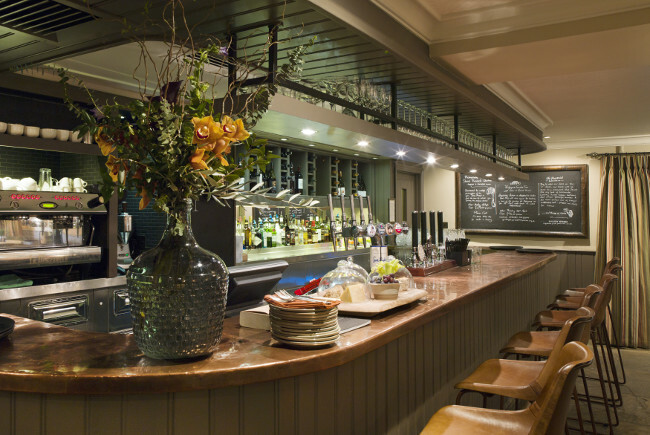 And with two restaurants to choose from, The Conservatory for relaxed fine-dining and The Gumstall Inn, Calcot’s very own gastropub there’s food to cater for everyone’s taste buds. The manor itself dates back from the 14th Century and is simply stunning. Not wanting to miss a moment of our 24 hours of freedom, upon arrival we made our way to the hotel entrance. The hallway to reception is the ultimate instagramable spot, with its matching Wellington boots lined up in a row, with pretty plants and flowers mixed amongst them. It oozes Cotswolds charm meets the great outdoors in the chicest of ways. After a swift check in we were shown to our beautiful room. The majority of the rooms are in separate buildings to the main house. We were booked into a cosy room that looked out onto the main courtyard of stone farm buildings. The courtyard itself is draped with beautiful flowers and shrubs making you feel as though you’ve been transported into a relaxing retreat – on a summer’s day it would make a glorious spot to enjoy a glass of fine wine or two. The room was decorated much like the main house, a mix of contemporary meets traditional décor – from books on the shelves to a cute bay window – it was hard not to just relax in our room for the duration of our stay; but with one of the UK’s most popular spas on offer, we tore ourselves away. Feeling brave, we headed straight to the outdoor hot tub with the smell of smoke from the open fire in the air. This for me is the ultimate Cotswolds scent. After a long soak in the hot tub, we headed into the relaxation area before taking some time out on the sauna and steam rooms. The dressing rooms in the spa, are slick and clean as is the ‘dining’ area where you can relax with a herbal tea or glass of champagne if you wish. I’ve visited many hotels in the past where this area is so dated, but Calcot has expertly kept it modern and airy, yet comforting and inviting. 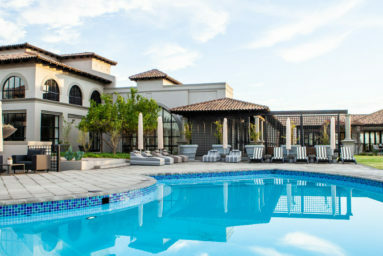 However, if the spa isn’t for you, then there’s plenty of activities to choose from. From the tennis courts to outdoor pool, a dedicated kids playground, creche, woodland gymnasium, mini football pitch, a disc golf course, free bikes to hire and horse riding you can have a jam-packed stay if that’s more your thing. However, for us, this weekend break was all about relaxing from the daily grind, and before we knew it, it was time to go and get ready for dinner. 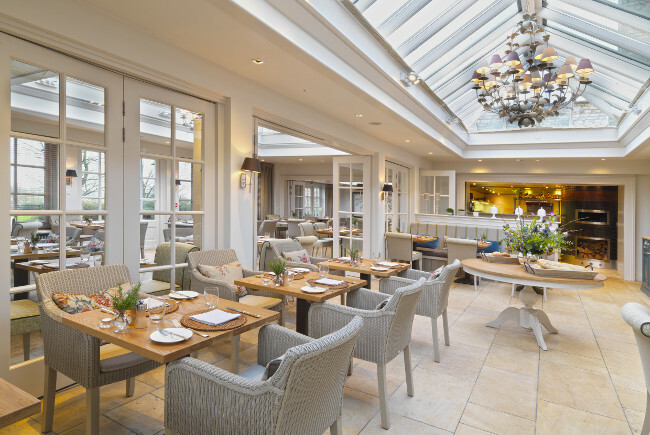 We were dining in The Conservatory where the huge windows meant that on a spring evening you can gaze at the breathtaking views of the surrounding grounds as you dine. The extensive and seasonal menu offers something for everyone, from steak to turbot. We opted to start with duck liver parfait with pear chutney that was utterly scrumptious. We also enjoyed sharing the heritage beetroot salad. For our main’s we both choose the Loin and crisp shoulder of Wiltshire lamb, spiced aubergine, artichoke and grilled spring onion – it was so delicious neither of us wanted it to end. With full tummies, we headed back to our room to our lovely turndown service – something I always love about five-star hotels. After a comfy night’s sleep, we woke up in our beautiful setting and headed to the main house for breakfast. With everything on the menu from continental to cooked, we enjoyed eggs benedict and eggs and smoked salmon with a delicious coffee as we enjoyed reading the morning’s news. With a blink of an eye, it was time to leave so with heavy hearts we waved goodbye to the stunning country manor that is Calcot. 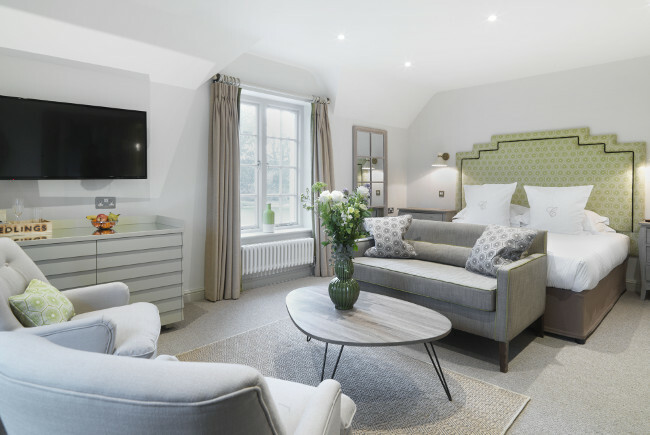 So, if you’re looking for a staycation with family or friends then Calcot is the ideal place that allows you to escape from reality. Rooms start from £209 per night including breakfast, based on two sharing.